ThermiSmooth™ is a revolutionary new skin tightening technology that diminishes the visible signs of aging, using state-of-the-art targeted heat delivered to the skin’s surface, which tightens and increases collagen production. It’s safe to use on nearly all areas of the face and delivers a more youthful looking appearance by reducing sagging skin around the neck, mouth, eyelid, forehead and even under eye bags – as well as noticeably improving facial wrinkles and lines. Healthy skin starts at the structural level and collagen is the substance that gives youthful fullness and volume to the face. Collagen production slows with age which causes the body to lose volume and tone. Facial contours may begin to droop, and skin might start to sag, causing a person to look (and feel!) older. We offer ThermiSmooth™ Skin Tightening procedure in our Birmingham, MI Medical Spa. This treatment visibly counters the effects of aging by using a specialized device to expose collagen under the facial skin to sustained heat greater than 40ºC, which begins a process that causes the skin to tighten and reduces the look of sagging skin and wrinkles. During the procedure, the patient remains comfortable as the heat is applied in a precise and controlled method. Patients see visible plumpness and tightness of the face immediately after the procedure which stimulates collagen production beneath the skin naturally during the treatment. Over the next 3 to 6 months, patients see the full results develop as the body continues to build more collagen. The ThermiSmooth Skin Tightening Procedure uses a specialized handpiece that applies specific target temperature radio-frequency heat to the face. A lubricating gel is applied to the treatment area before the handheld device is gently applied to the face using a rotating or sweeping motion. The radio-frequency gradually heats the skin to over 40C and feels like a warm massage to the patient. ThermiSmooth™ Skin Tightening sessions performed in the Birmingham, MI Medical Spa usually last about five to ten minutes per each treatment area. During this time, the handpiece will automatically adjust its radio-frequency temperature depending on feedback received from the patient’s skin. The Thermismooth™ skin tightening procedure delivers the most effective results while it keeps the patient comfortable and completely safe. The exclusive ThermiSmooth™ technology is the only one of its kind that treats a patient’s unique skin condition with an adjustable heat setting to allow for optimal results using a superior temperature control system. Unlike harsher laser treatments and chemical peels, patients can return to their everyday routine right after a ThermiSmooth™ Skin Tightening session. There’s literally no recovery time, just a slight pinkish color that may appear within the treatment area, which will disappear quickly. Dr. Ali will consult with each patient and review the general condition of their skin to determine the number of ThermiSmooth™ Skin Tightening treatments needed. Multiple sessions may be required to reach the patient’s desired goal, but the results are truly amazing. 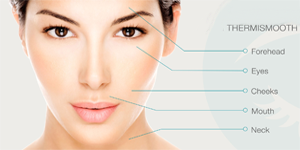 AMAE Med Spa is operated by Birmingham, MI board certified plastic surgeon Dr. Ali. He and medical aesthetician Ramona are trained and licensed ThermiSmooth Specialists. They will take the time to understand your appearance goals, assess your facial and skin condition, and develop a skin treatment or anti-aging plan that is right for you. At our Birmingham Med spa, we offer the latest and best technologies in skin care and anti-aging, including ThermiSmooth tightening and rejuvenation. Schedule a consultation to see if ThermiSmooth, or another skin tightening treatment is right for you.